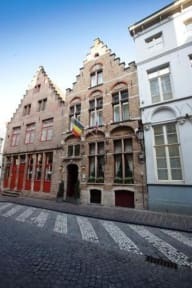 Situated in the heart of magnificent Bruges, the hotel is ideal for cyclists and perfect for discovering the old town of Bruges and its surrounding area. A warm welcome awaits you in a quiet and friendly atmosphere. Our pleasant rooms provide every comfort and they all have their own bathroom with shower. Coffee and tea facilities in the room are standard. 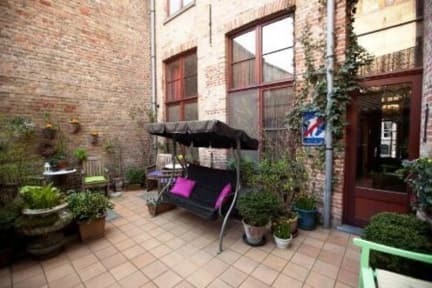 You will experience Belgian hospitality in this typical Bruges town house that instantly becomes home to every guest. Families are very welcome to our family suite, which is ideal for parents and their children. You start the day with a full, refined, hearty breakfast in our 16th century cellar. Please let us know if you need any information on tourist attractions, excursions, bicycle rental, museums, etc. In the afternoons you are invited to have a free cup of coffee or tea in our lounge. A PC is available at no extra charge and there is free Wi-Fi all over the hotel and in all the rooms. On a nice day you can enjoy our patio with its gorgeous flowers and plants. Our hotel becomes a home to every guest!